Sorry for not blogging for a while!! 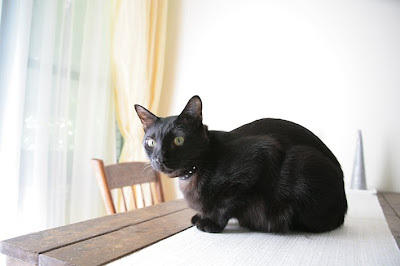 We have been blogging in Japanese but couldn't do in English! Mommy has so many works these days. One of our friends has gone to the bridge. One of our friends had a birthday. One of our friends is looking for a forever home. And mommy wanted to make the illustrations for all of them. Mommy has nasal congestion and she thought it was because of an allergy. So she went to the hospital today. But the doctor didn't think it was an allergy. She needs a blood test. But she always faints! So the doctor gave her medicines and decided not to do the blood testing today! YAY! Anyway we think it is not a serious problem. Maybe she was a tiny bit tired. 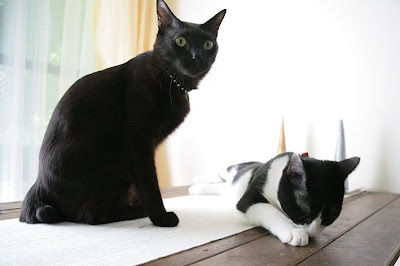 She had no energy left to translate our blog into English. Hope you won't forget us and will come see us again! 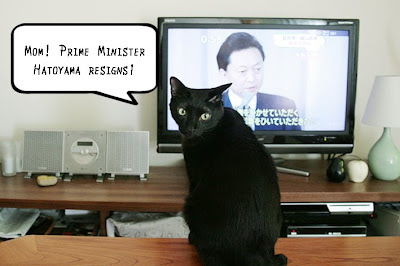 But today,we had a big news about our prime minister. Today,we are posting our today's post! What is a child allowance? Ku-suke was enjoying a beautiful morning today,too! "Mom!! Why is Teko here again? " Mom thought we were going to start fighting. But suddenly,Ku-suke lost his interest. Mom went to a school of photography for 2 years when she was young. 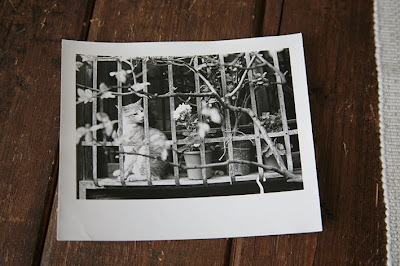 This is the very first photo that she took by herself,developed by herself,printed by herself. 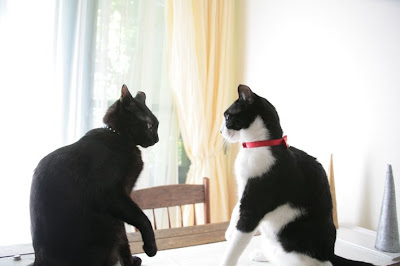 Mom loves this picture,but in school,mom was scolded because her photos were almost only cats!! Oh Teko's mum!!! Please take care and get better! And rest - that always helps! Gosh that is news isn't it?? 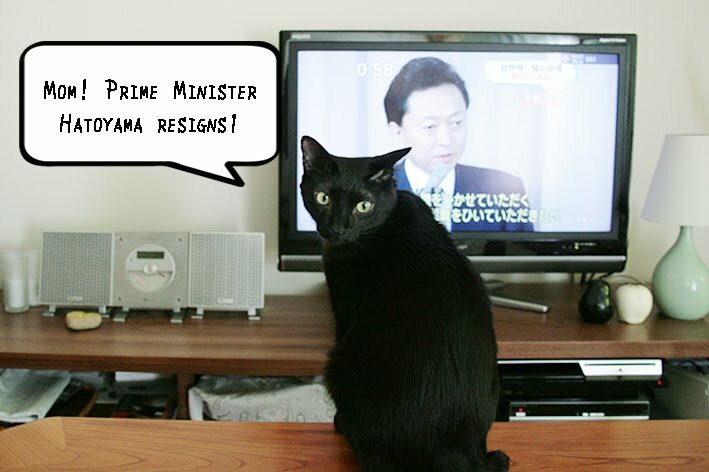 We hope your next government will listen to you Teko and give all kitties free tuna! Yay!!! You are very wise indeed! 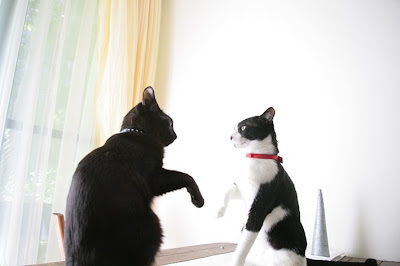 And well done Ku-suke and Teko for not fighting - your mum needs peace and quiet so you are great kitties for helping her. 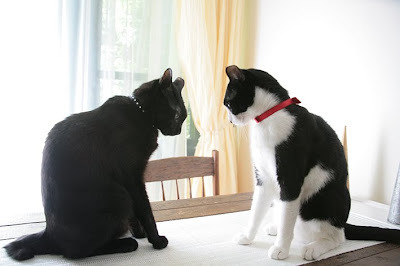 Awwww we are sorry your mum got scolded for taking beautiful pics of beautiful kitties!! She is very talented and we're glad that she's carried on taking wonderful pics of you and Ku-suke and sweet B-sensei! Me and Charlie are very sorry to hear that one of your friends has gone over the bridge. 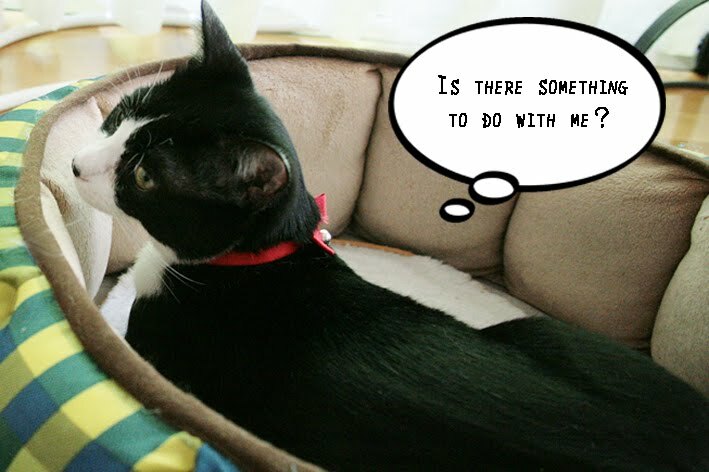 We hope your other friend finds a forever home. Happy birthday to your birthday friend! We are sorry to hear Mom has been sick. 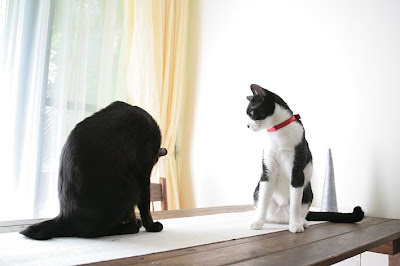 It is bad when moms are sick; however, she still managed to post a beautiful blog today. You all take good care of her. Mom we love your very first photo!!! We are sorry to hear your mommy isn't feeling well. We hope she gets better furry soon and are sending her get well NOW purrs! Glad to see you're back and that picture your mom took is fantastic! 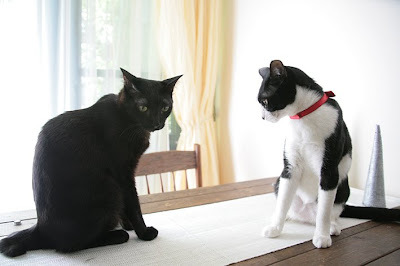 Oh we understand about not blogging - our mom always has excuses! Don't worry we will always be back to visit you. We are sorry you have a friend who had to go to the bridge - we know that is so sad. And we also are sorry your mom is not feeling good - and we are sending her lots of purrs to feel better soon! Our dad also faints when he has to have a blood test - our mom is used to them but our dad is not! 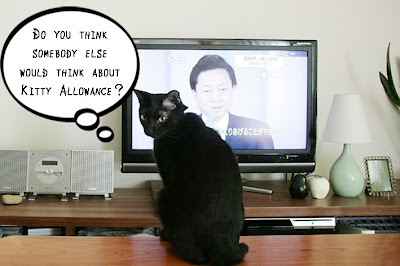 We think a tuna allowance is a good idea - if you can get that happening in Japan, maybe the US will follow and we can have one too! We love all the pictures of you and our mom said to tell you that she is like your mom - she studied photography in school too! She can also develop her own pictures. Most of our mom's pictures were not of cats though - her kitties at the time did not like to have their picture taken very often. We all think her first picture is beautiful! 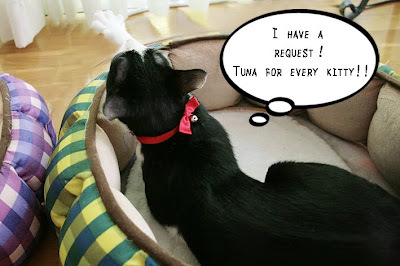 How about tuna for every kitty and puppy? Hope Mom feels better soon! We will always come by to see you! Your Mom has been very busy! We hope she feels better soon! You also have a blog in Japanese? How can we find it? Oh, we hope your mom gets better soon! Please make sure you take good care of her, okay? And tell her we LOVE her first picture form school. We see nothing wrong about taking lots of pictures of cats! We are so sorry to hear that mom isn't feeling well. We hope she feels well soon. We think you mom's first photo was wonderful Cats are wonderful subjects for pictures. Tuna for every cat and an allowance sounds good to us, but we would want Fancy Feast instead of tuna. We loved all the pictures. I hope your mommy feels better soon!! Cats should rule the world! :) Love your political views! I don't see anything wrong with taking pictures of subjects that interest you! My photos are mainly goldens!